The poster represents the Earth today and the Earth "If we do recycling". 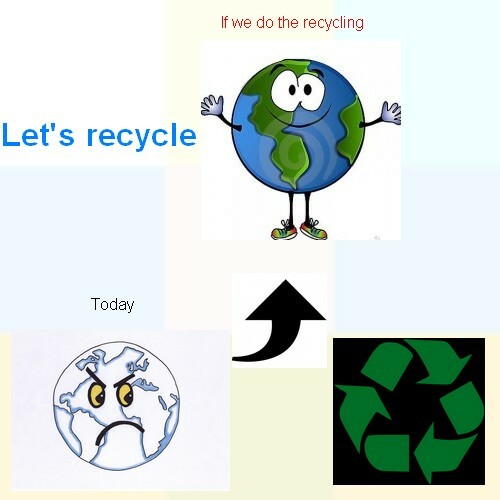 The poster is composed of the Earthtoday and the Earth if we do the recycling on a white background. The motto is "Let's recycle". If the people put theirs, the Earth will be preserve. The but of poster is the less the recycle, pollution and deforestation. The logo green with arrows is the logo of recycle. The logo is green colours because the logo represents the nature. The colours red represents the discontent of the Earth without the recycle the green: the recycle and the nature preserve. Today, preserve the Earth for the world better for the recycle.